Pausing to consider what problem-based and distance learning have in common, it is tempting to argue that both play a role in liberating the learner. While PBL empowers the student to discover information for her- or himself, and to value that which is on offer through experience, distance learning makes education possible, even if a teacher is not close to hand (Rowntree, 1986). Both problem-based and distance learning claim to be student centred and facilitate the student in becoming a critical and independent thinker (Barrows and Tamblyn, 1980; Evans and Nation, 1989). Beyond this, however, there are significant difficulties in bringing the two educational approaches together. 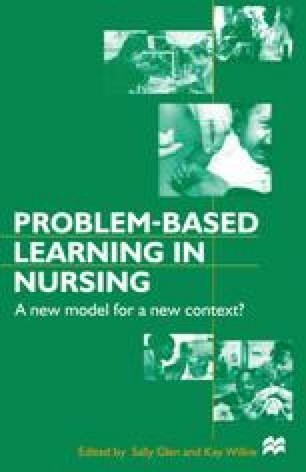 That which is assumed to be pivotal within PBL (for example, a facilitative tutor who has sustained and non-directive contact with students; Little and Ryan, 1988; Creedy and Hand, 1994) is not usually practical within distance learning. Distance learning, with its emphasis upon delivering a multitude of information in an accessible manner, seems the antithesis of learning by discovery. In short, PBL would seem to emphasise education as a process, while distance learning, by choice or necessity, is often portrayed as a product-driven system of learning.